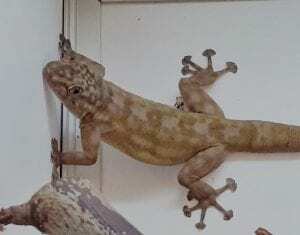 A small to medium sized gecko species that commonly occurs in North Africa and western Asia.They are very adaptable as a species, and are found in a variety of habitats including around human habitation, wooded areas, stone walls, agricultural and many others. They can be found in relatively dry terrain, and also in more humid areas. In captivity they are easy to maintain. 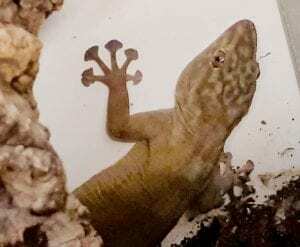 A vivarium measuring a minimum of 3x2x2 is fine, three feet tall would be better. Daytime temperatures should be in the region of around 30-32C, dropping by a few degrees at night – perhaps to around 22-25C. Lighting for species like this is a debatable topic, the more recent school of thought is to provide a “scattered” lower powered UVB as well as full spectrum. They can be kept in pairs, or multiple females (but never multiple males) but squabbles can occur. A wide variation of insects, supplemented with a good quality vitamin and mineral powder, needs to be provided. A water area is required, and a daily light to moderate spraying is beneficial. For breeding purposes a brumation period of around eight weeks is required. Temperatures need to be reduced to around 10-15C, with disturbance kept to a minimum. Once temperatures are increased mating activity occurs and after around twenty to thirty days two sticky eggs are laid – usually attached to a smooth surface, but occasionally buried.